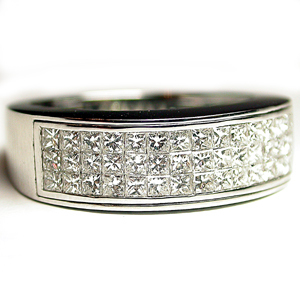 Three rows of invisible princess-cut diamonds are set in this lovely 18 karat white gold ring. The diamonds total 1.06 carat and are graded F/G color-VS clarity. The band is 6.7 mm wide on top tapers to 4.5 mm on the bottom. Stock size,7. This ring will come with a 5935.00 appraisal.